The King's Speech is a solid film which never attains the greatness to which it aspires. By choosing the easy route, and smothering the darker, crueler core of its story under a tidy triumph, it ends up a good film, where it could have been a great one. The King's Speech is essentially a sports film, and sports films are usually the same. They start with our hero, the underdog, undergoing a humiliating defeat. After licking his wounds (and it is usually a 'he'), the underdog discovers the key to his reformation and success - usually an inspiring mentor or coach. After a rousing training montage, we build up to the inevitable denouement - usually a rematch with the earlier opponent - which, after some tense last-minute uncertainties, ends in (inevitable) glorious victory. The best sports films are those that bend the genre - films like Eight Men Out, that open with victory and end with the abyss. Director Tom Hooper is no stranger to such films - just see his work from last year, The Damned United, which used the harsh clarity of defeat to really examine our ambition to win. 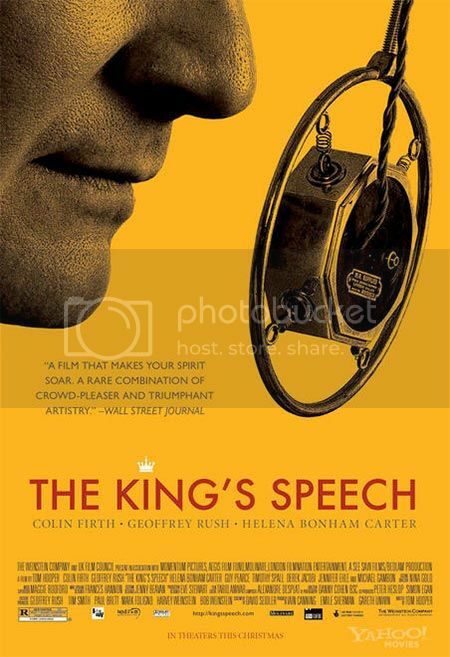 The King's Speech should have been such an innovative sports film - a film that let our character, King George VI (Colin Firth), wallow in his misery and explore it. Instead, we get the trials and complexities of England's waning royalty under the gathering storm of World War 2 shoe-horned into a feel-good movie complete with Disney-style pop psycho-analysis. Our hero, underdog Duke of York, is second son to King George V (a spot-on Michael Gambon) and an embarrassment to the family. In an age of the radio, where the royal family has been "reduced to ingratiating" themselves into England's living rooms via the "Pandora's box" of wireless technology, the Duke - Bertie to his wife (Helena Bonham Carter) and family - is a terrible public speaker. He suffers from a stutter and paralyzing stage fright. The film's opening defeat shows him giving a cringe-worthy speech to the crowds at Wembley (?) in 1925. Ten years later, Bertie meets his mentor and coach - the unorthodox, transplanted antipodean Lionel Logue (Geoffrey Rush - nice to see you again!). Logue insists on equality in the counseling room, and couples his speech therapy with some pop Freud as well. Bertie's stutter will never improve, Logue reckons, if we don't unearth some of the anxieties which eat away at him from the inside. Bertie - clinging to the formalities and automatic distance that his title engenders - rebels. But then comes around. Then, after his father dies and his older brother abdicates in favor of a Baltimore divorcee, becomes king. And then war breaks out. And then he gives his speech. The best parts of The King's Speech, as we've hinted at above, are the darker parts. Logue's non-speech therapy might be a bit Good Will Hunting, but there is a real edge to seeing the surreal, dehumanizing effect royalty has on everyone involved, not just Bertie - the cavernous palace rooms, the stiff ritualism of family affairs, the easy bullying. Bertie is, of course, the most obviously wounded of the lot - his stutter a paper-thin disguise to the deep insecurities he has been raised to feel. In one harrowing scene, Logue - ever awkward in reconciling his everyman conviviality with the formalities required in dealing with Bertie - attempts to console Bertie shortly after the latter's father's death. Bertie then haltingly describes his gruesome "personal affairs" - up to this point, taboo - and we hear of abuse, neglect, alienation. It's ironic that Geoffrey Rush's performance in this scene - that is, his reactions - almost outshines Colin Firth's. Another excellent detail is the tempestuous anger which Bertie exhibits - and how he explains away his sudden explosions as "one of my many faults". It's these hints at dysfunction and decay that round out both the character of Bertie and the story of England's royalty under the war. And as war brews and Bertie is faced with his most important public speaking event yet - a cry to rally the troops - we can't help but feel like forcing the complicated private and public issues into one mishmash of "Hurrah for perseverance!" is facile. Anyway, on the purely movie front: Timothy Spall's spot-on Winston Churchill impression was stunning in the lengthier scenes and distractingly funny in the shorter moments, where it began to feel like a caricature. Turning the Archbishop of Canterbury (Derek Jacobi) into a thorny old guard antagonist was uninspired, as were the easy jokes about snobbish, stiff upper lip English royalty looking down on Australians. That said, it was nice, in a meta way, to have Australian actor Guy Pearce, as the dandy older brother and very-briefly-King Edward VIII, speak in the poshest accent ever. Helena Bonham Carter was wonderfully sympathetic as, well, the Queen Mother (what are these people's names, anyway?! Bertie said his at one point and it had, like, ten names in there), while Geoffrey Rush was his usual Geoffrey Rushy self. Colin Firth is a dreamboat as ever, and of course we felt a great rush of tenderness for him, as he was indeed incredibly vulnerable (and often humiliated!). Trivia: He played a WWI vet with a stutter in the glorious A Month in the Country. Other movie stuff: Tom Hooper's direction was reminiscent of his work in Damned United - canned saturation, geometrical compositions emphasizing dizzying wallpapers, symmetrical perspectives and a tendency to use off-center close-ups. It was nice in Damned United, but we were distracted this time. The use of Beethoven's 7th was DIVINE, I tell you - but then, that music is divine. There was a whole 'nother movie in there. And hearing Bertie describe Hitler as advocating the "primitive doctrine that Might is Right" threw us right back to The Once and Future King - so that's what T.H. White was referring to: Bertie's speech! Oh my God, ARTHUR IS BERTIE, WE SEE IT NOW. Well, that is just something. So: see it? Yes, definitely, but perhaps wait for DVD. I've been meaning to head off to the theaters to see this, mainly because I'm a sucker for pretty much any sort of period film. Sorry to hear that it's not a huge success, but it does sound like a good rental. Nice review. I saw this yesterday, and while I really, really liked it, I did feel that it didn't quite achieve greatness. I think the sports film analogy is a good way to describe the shortcomings. I agree that some of the casting (Pearce, Bonham Carter) worked better than others. At a certain point it did become a bit of a distracting game of "spot the actor from Harry Potter-BBC period miniseries-Mike Leigh films." Koci, I shouldn't pay a lot of attention to this review. I know of people who have been to see the film multiple times already. And how do you account for people applauding the film if it is not good? Go and see the film is my advice, you won't be disappointed. Anonymous raises a good point, actually - this is definitely a crowd-pleaser, and I don't want to downplay how enjoyable it is. The showing I attended had a smattering of applause as well. And I think it's definitely a feel-good movie: overcoming adversity, sticking it to the Nazis and reveling in adorably antiquated, Anglophilic tales of class and royalty - how could you not feel at least a little warm and fuzzy? I guess my main beef was that I had hoped for something with the same weird, anti-heroic and classical undercurrents as Damned United - something that had a feel-good sports movie on top with a darker Shakespearean thing underneath (as Damned United was Henry IV and V-ish). They could have done it too, what with Geoffrey Rush doing Richard III! Drawing parallels between Richard and Bertie would have been cool, e.g. I saw the movie while visiting relatives. It does a great job of portraying the everyday frustrations of those of us who stutter. Hopefully, seeing the movie and/or reading the reviews will make everyone interested in learning tips for talking with someone who stutters by the Stuttering Foundation (www.stutteringhelp.org). People still think that telling us to “slow down” or “take a breath” are helpful, but they are not.